Alphie is a great educational tool. Durable and fun for my grandson to use. He loves playing and learning at the same time. Playskool has done their user research. 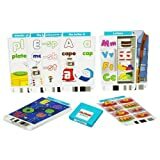 Alphie is one of the best learning toys out there! And the additional packs make it even more fun. My daughter spends hours playing with Alphie, more than other toys. The Letters pack has many more options than the original pack, so you don’t have the redundancy. I can’t wait to give her the number pack!